When managing your server with InMotion Hosting, you can utilize the Web Host Manager (WHM) of your VPS or Dedicated hosting server to find what type of server you have. The below steps will explain how to view your server processor Information, system information, current memory Usage, and current disk usage. Important! You can only view this information on VPS or Dedicated servers. Shared servers have no WHM access. Navigate to Home > Server Status > Server Information. Scroll to the bottom to see the Memory and Disk space. The image below shows what the section looks like. Memory usage can be viewed in the server information stats. Below is an excerpt of the Current Memory Usage on a VPS1000. The total memory is burstable memory, in this case 1 gig for the VPS1000 plan. If it were a VPS3000, the number would be 3145728 kilobytes. The used is the total memory currently used by the server. The free memory is what the server has left to use. 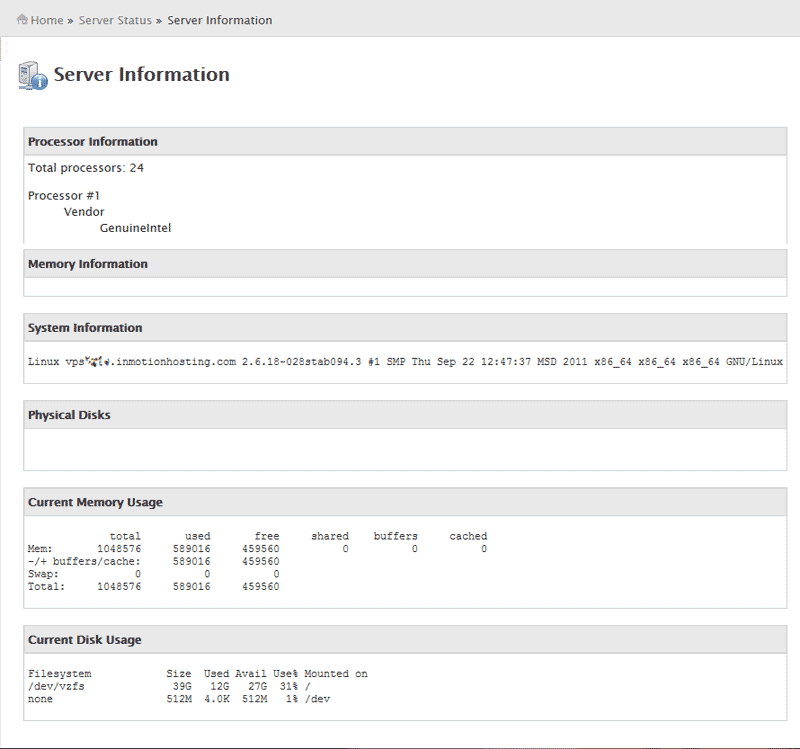 Below is an excerpt of a VPS server with a VPS1000 plan. The Size is the total disk space on the server. In this example, this is a VPS1000 plan because it has 40 gigs of space. If you upgraded to a VPS2000, you should see ~80gigs (The actual size will be a few gigs smaller in order to store server required information). The Used is the total space used including all cPanel accounts, the server Operating Systems, and systems files. The Avail is what's available on the disk and the Use% is the total used in percent. Did you know? In addition to Dedicated and VPS Hosting, InMotion also provides WordPress Hosting services? Let us take your WordPress site to the next level! Sorry, but I'm not sure what you're referring to. By default, cPanel is running as the interface. Beyond that, nothing is loaded on the server. You have to load it or make a request to load it yourself. You can also use phpinfo.php to see the support applications that are running in the background (.e.g php, mysql, etc). Is there a way to see some sort of graph that shows how and when the memory is being used over the month? For example let's say I want to know if there is a moment of the day where I almost run out of memory, where can I check that? You can check the "Daily Process Log" under Server Status in WHM.